In Central and Eastern Europe, as in most other economies, the leather and leather products sector is a small part of manufacturing, shaped by globalization and easy relocation of production. It is considered a labour-intensive, low-skill and low-technology industry, producing basic necessity goods (shoes) but also luxury items (leather handbags, luggage etc.). In Central Europe, the sector was neglected during the former command economy and also faced hard times during transition. 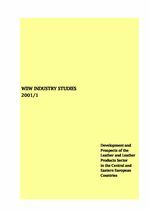 The study investigates the development and prospects of the leather and leather products sector in the following countries: Bulgaria, the Czech Republic, Hungary, Poland, Romania, Slovakia, Slovenia. In size, the leather and leather products sector is the smallest segment of manufacturing in most CEECs today and contributes between 0.7% to manufacturing output in the Czech Republic and about 1.7% in Romania. Specialization on the sector continued in Slovenia and started later in Bulgaria and Romania. As is typical for all CEECs and all sectors of manufacturing, wages, productivity and unit labour costs (exception: Slovenia) in the leather and leather products sector have generally been much lower than in West European countries, for which we use Austria as a point of reference. During transition, sectoral wages rose in all CEECs while productivity increased only in Hungary, Poland and Romania. Hence, unit labour costs remained constant only in these three countries and rose in the others. Nevertheless, the estimated unit labour costs remain at a much lower level than in Austria (except in Slovenia). On the EU market, in 1989, CEEC leather and leather products exports had a market share of about 4%, which increased to 12% in 1998 (all shares without intra-EU trade). This share lay somewhat above total manufacturing market shares (3% in 1989 and 8% in 1998). On the Austrian market, CEEC exports had a decisively larger share, accounting for 26% of Austria's non-EU imports of leather products in 1995, increasing to 35% in 1998. However, the CEECs are also a major export destination for Austrian leather exports and absorbed about 44% of Austria's non-EU leather exports in 1998. Ultimately, the CEECs registered a trade deficit with Austria. Future prospects of the sector are not very favourable, due to decreasing export competitiveness (declining comparative advantage, growing trade deficits, increasing wages in the long run, growing competition from low-cost countries) and increasing import competition on domestic markets with considerable growth potential. Hence it seems that the hard times for the leather and leather products sector in the CEECs are not over but will continue in the future.